And it is all … FOR THE KIDS … to continue Penn State’s 37-year tradition of saving children from the grip of pediatric cancer. 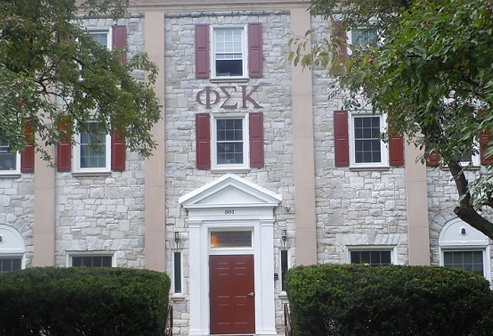 Thanks to our chapter’s yearlong canning and fundraising efforts, we contributed $46,060 toward Penn State’s $13,343.517.33 total that will be given to the Four Diamonds Fund at Penn State Hershey Children’s Hospital. 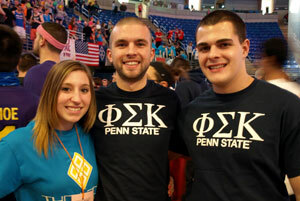 Dancer Lauren Scamdone joins Phi Sigma Kappa brothers (l-r) Christian Guerriero and Anthony Scaringelli. As the crowd erupted in screams and applause, parents could be seen holding tightly to those THON children who have embraced the hearts of our Greek community at Penn State. It is the power of hope … hope for one more day, week, month or year … that our chapter is helping to give to families across the state. We are fortunate to be part of such a life-giving effort at Penn State that does, in fact, redefine the possibilities. So, thank you to our dancers, brothers who stood by the dancers, captains, parents who attended, alumni who stopped by and to the entire THON organization for its incredible support. This is why … WE ARE.